Sometimes businesses need to contact people quickly and reliably, even if they are out all day. People check their phones every day. The mobile phone is probably the last thing people see before they sleep and the first thing they check when they wake up – then they put it in their pocket and carry it everywhere. 98% of text messages received by people are read. If you own a café, restaurant, club or pub, you can send bulk SMS promotions to your local customers on slow days. Ask customers to show their SMS message at the counter that same day to redeem your special offer. No graphic design, letterbox drops, or telemarketing required. Just instant results. If you are a health professional, beauty therapist, lawyer or accountant, you can remind customers of their appointments in advance, in a way you know will reach them. Save those annoying, forgetful no-shows that waste your time. Keep your receptionist free for other, more important tasks. You can send SMS reminders to your entire day’s appointment list in an instant, and know it went straight to their pocket. 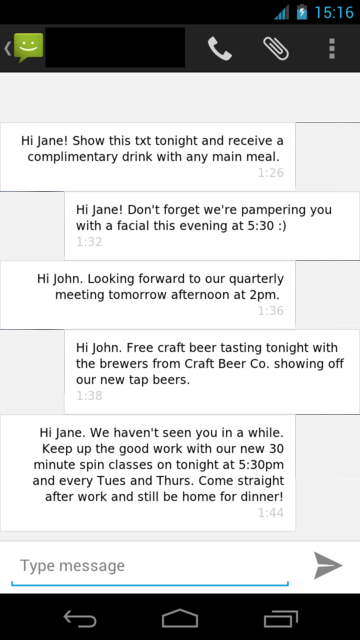 SMS is a simple, short text message that cuts straight to the point and goes to an entire list straight away. tecset offer both Self Managed and Fully Managed SMS marketing. Self Managed – you have your own unique access to our portal containing your own database. You control the content of the messages, who they are sent to, and the time schedule. Fully Managed – we manage your database and your SMS messages on your behalf. Great for business who don’t have time, or don’t want to get heavily involved in their SMS campaigns. tecset can help you build a database of customer mobile numbers, send to targeted sets from your list, and write the text that gets the best results. Contact us to get started now!